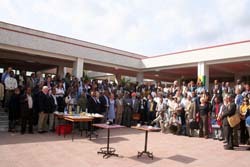 In June, Addis Abba University (AAU) invited members of the international academic community to its Akaki Campus to share in their new goal to strengthen the overall higher education capacity of the country. U of T AAU delegation: (L-R) Mike Landry, Yu-Ling Cheng, Gena Piliotis, Sandra Kendall, Bob Hilliard, Astrid Greaves, Jane Philpott, and Clare Pain. (L-R) AAU Professors Zebene Kiflie, Nurellegne Tefera, Berhanu Assefa, and Wlodzimierz Sokol (visiting professor from Poland). Professor Yu-Ling Cheng (ChemE), along with 12 other U of T faculty, traveled over 11,000 km to attend the International Workshop on PhD Programs to support AAU's mission to expand its graduate education and research capacity. Founded in 1950 with only nine academic staff and 71 students, Addis Abba University (AAU) is the largest and most prominent university in Ethiopia, and one of the largest universities in Africa. With 14 campuses across the country, AAU is now home to 40,000 undergraduate students, 6,000 graduate students, and 2,070 faculty members. 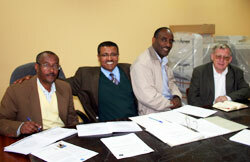 AAU is now attempting to increase faculty training for both itself and existing and emerging universities in Ethiopia. To achieve this, they have set an ambitious goal to produce 5,000 PhD graduates in 10 years and to establish 14 centres of excellence in research and teaching in key areas. To help them achieve their new mission, AAU is drawing upon its international connections for assistance to help them design curricula, assist with in-house PhD programs, and co-advise PhD students. U of T’s Faculty of Medicine has been involved with AAU for over half a decade. Six years ago, AAU wanted to train more psychiatrists since there were only 7 psychiatrists for the entire country, which had a population of approximately 70 million people. Championed by Dr. Clare Pain, the U of T's Department of Psychiatry has been sending faculty members and senior residents to Addis Ababa for the past six years to help train new psychiatrists. There are now 34 psychiatrists in Ethiopia, partly in thanks to the grass roots level education assistance from the Faculty of Medicine. U of T's Psychiatry Department has benefited as well. Dr. Pain credits the opportunity to work with Ethiopia as a major factor in their ability to attract world class quality residents. 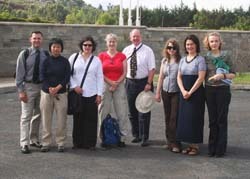 There are now similar opportunities for Engineering faculty to help shape the future of Ethiopia. One of AAU’s key areas of focus is Engineering, and the University is seeking international faculty members to assist with co-supervising AAU Engineering PhD students to help them reach their goal of 5,000 PhDs in 10 years. The co-supervision envisioned is primarily electronic-based, with face-to-face interaction once or twice a year. There is also the opportunity for international faculty to teach short format (two weeks to one month) graduate courses at AAU to help with their post-secondary education initiatives. There’s a growing recognition in the global community that educational aid is important, and university education is paramount. Several African countries are starting new science and technology universities. made, and everyone from the Toronto delegation felt privileged to be present. AAU is asking for help in nearly every discipline in Engineering." If you are interested in being involved with AAU's initiative, please contact Professor Yu-Ling Cheng.